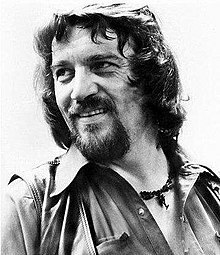 Waylon Arnold Jennings (pronounced /ˈweɪlən ˈdʒɛnɪŋz/; June 15, 1937 – February 13, 2002) was an American singer, songwriter, and musician. In 1958, Buddy Holly arranged Jennings's first recording session, and hired him to play bass. Jennings gave up his seat on the ill-fated flight in 1959 that crashed and killed Holly, J. P. "The Big Bopper" Richardson and Ritchie Valens. During the 1970s, Jennings was instrumental in the inception of Outlaw country movement, and recorded country music's first platinum album, Wanted! The Outlaws with Willie Nelson, Tompall Glaser, and Jessi Colter. Jennings began playing guitar at eight and began performing at 12 on KVOW radio, after which he formed his first band, The Texas Longhorns. Jennings left high school at 16, determined to become a musician, and bounced around as a performer and DJ on KVOW, KDAV, KYTI, KLLL, in Coolidge, Arizona, and Phoenix. He formed a rockabilly club band, The Waylors, and enjoyed a residency at "JD's", a club in Scottsdale Arizona. He recorded for independent label Trend Records and A&M Records, but did not achieve success until moving to RCA Victor, taking on Neil Reshen as manager, who negotiated significantly better touring and recording contracts for him. After finally wresting creative control from RCA Victor, his career turning point became the critically acclaimed albums Lonesome, On'ry and Mean and Honky Tonk Heroes followed by hit albums Dreaming My Dreams as well as Are You Ready for the Country. 1976's platinum certified Wanted! The Outlaws was followed by Ol' Waylon and the hit song "Luckenbach, Texas". Jennings was featured in the 1978 album White Mansions performed by various artists documenting the lives of people in the Confederacy during the Civil War. The songs on the album were written by Paul Kennerley. Jennings also appeared in films and television series, including Sesame Street, and a stint as the balladeer for The Dukes of Hazzard, composing and singing the show's theme song and providing narration for the show. By the early 1980s, Jennings was struggling with a cocaine addiction, which he overcame in 1984. Later, he joined the country supergroup The Highwaymen with Willie Nelson, Kris Kristofferson, and Johnny Cash, which released three albums between 1985 and 1995. During that period, Jennings released the successful album Will the Wolf Survive. He toured less after 1997 to spend more time with his family. Between 1999 and 2001, his appearances were limited by health problems. In 2001, he was inducted into the Country Music Hall of Fame, which he chose not to attend. On February 13, 2002, Jennings died from complications of diabetes. In 2007, he was posthumously awarded the Cliffie Stone Pioneer Award by the Academy of Country Music. Waylon Jennings was born on June 15, 1937, on the G.W. Bitner farm, near Littlefield, Texas. The Jennings family line descended from Irish and Black-Dutch. Meanwhile, the Shipley family moved from Tennessee and settled in Texas. The Shipley line descended from Cherokee and Comanche families. The name on his birth certificate was Wayland, meaning land by the highway. His name was changed after a Baptist preacher visited Jennings's parents and congratulated his mother for naming him after the Wayland Baptist University in Plainview, Texas. Lorene Jennings, who had been unaware of the college, changed the spelling to Waylon. Jennings later expressed in his autobiography, "I didn't like Waylon. It sounded corny and hillbilly, but it's been good to me, and I'm pretty well at peace with it right now." After working as a laborer on the Bitner farm, Jennings's father moved the family to Littlefield and established a retail creamery. When Jennings was eight, his mother taught him to play guitar with the tune "Thirty Pieces of Silver". Jennings used to practice with his relatives' guitars, until his mother bought him a used Stella, and later ordered a Harmony Patrician. Early influences were Bob Wills, Floyd Tillman, Ernest Tubb, Hank Williams, Carl Smith, and Elvis Presley. Beginning at family gatherings, Jennings advanced to perform at the Youth Center with Anthony Bonanno, followed by appearances at the local Jaycees and Lions Clubs. He won a talent show at Channel 13, in Lubbock, singing "Hey Joe". He later made frequent performances at the Palace Theater in Littlefield, during local talent night. At 12 years, Jennings auditioned for a spot on KVOW in Littlefield, Texas. Owner J.B. McShan, along with Emil Macha, recorded Jennings's performance. McShan liked his style and hired him for a weekly 30-minute program. Following this successful introduction, Jennings formed his own band. He asked Macha to play bass for him, and gathered other friends and acquaintances to form The Texas Longhorns. The style of the band, a mixture of Country and Western and Bluegrass music, was often not well received. At age 16, after several disciplinary infractions, tenth-grader Jennings was convinced to drop out of high school by the superintendent. Upon leaving school, he worked for his father in the produce store, also taking temporary jobs. Jennings felt that music, his favorite activity, would turn into his career. The next year, Jennings and The Texas Longhorns recorded a demo of the songs "Stranger in My Home" and "There'll Be a New Day" at KFYO radio in Lubbock. Meanwhile, he drove a truck for the Thomas Land Lumber Company, and a concrete truck for the Roberts Lumber Company. Tired of the owner, and after a minor driving accident, Jennings quit. Jennings, and other local musicians, often performed at country radio station KDAV, and it is during this time he met Buddy Holly at a Lubbock restaurant. The two often met during local shows, and Jennings began to attend Holly's performances on KDAV's Sunday Party. In addition to performing on air for KVOW, Jennings started to work as a DJ in 1956, and moved to Lubbock. His program ran for six hours, from 4:00 in the afternoon to 10:00 in the evening. Jennings played two hours of country classics, two of current country, and two of mixed recordings. During those final two hours, Jennings played artists such as Chuck Berry and Little Richard. The owner reprimanded him each time he aired the recordings, and when he then played two Richard records in a row, the owner fired him. During his time at KVOW, Jennings was visited by DJ Sky Corbin, who worked at KLVT in Levelland. Corbin was impressed with his voice, and decided to visit Jennings at the station after hearing him sing a jingle to the tune of Hank Snow's "I'm Moving On". Jennings expressed his economic struggle to live on a US$50-a-week salary. Corbin invited Jennings to visit KLVT, where he eventually took Corbin's then-vacated position. The Corbin family later purchased KLLL, in Lubbock. They changed the format of the station to country, becoming the main competition of KDAV. The Corbins hired Jennings as the station's first DJ. Jennings produced commercials and created jingles with the rest of the DJs. As their popularity increased, the DJs made public appearances. Jennings's events included live performances. During one performance, Buddy's father, L.O. Holley, approached them with his son's latest record, and requested them to play it at the station. L.O. mentioned his son's intention to start producing artists himself, and Corbin recommended Jennings. After returning from his England tour, Buddy Holly visited KLLL. During his first recording session in September 1958, Jennings was accompanied by Buddy Holly on the guitar and King Curtis on the saxophone. Holly took Jennings as his first artist. He outfitted him with new clothes, and worked with him to improve his image. He arranged a session for Jennings at Norman Petty's recording studios in Clovis, New Mexico. On September 10, Jennings recorded the songs "Jole Blon" and "When Sin Stops (Love Begins)" with Holly and Tommy Allsup on guitars with saxophonist King Curtis. Holly then hired Jennings to play electric bass for him during his "Winter Dance Party Tour". Before the tour, Holly vacationed with his wife in Lubbock, and visited Jennings's radio station in December 1958. Jennings and Sky Corbin performed the hand claps to Holly's tune "You're the One". Jennings and Holly soon left for New York City, arriving on January 15, 1959. Jennings stayed at Holly's apartment by Washington Square Park prior to a meeting scheduled at the headquarters of the General Artists Corporation, that organized the tour. They later took a train to Chicago to join the band. The Winter Dance Party tour began in Milwaukee, Wisconsin, on January 23, 1959. The amount of travel created logistical problems, as the distance between venues had not been considered when scheduling each performance. Adding to the problem, the unheated tour buses twice broke down in freezing weather, with dire consequences. Holly's drummer Carl Bunch suffered frostbite to his toes (while aboard the bus) and was hospitalized, so Holly made the decision to find another means of transportation. Before their performance at the Surf Ballroom in Clear Lake, Iowa, Holly chartered a four-seat Beechcraft Bonanza airplane from Dwyer Flying Service in Mason City, Iowa, for himself, Jennings, and Tommy Allsup, to avoid the long bus trip to their next venue in Moorhead, Minnesota. Following the Clear Lake show (which ended around midnight), Allsup lost a coin toss and gave up his seat on the charter plane to Ritchie Valens, while Jennings voluntarily gave up his seat to J. P. Richardson, known as The Big Bopper, who was suffering from the flu and complaining about how cold and uncomfortable the tour bus was for a man of his size. When Holly learned that his bandmates had given up their seats on the plane and had chosen to take the bus rather than fly, a friendly banter between Holly and Jennings ensued, and it would come back to haunt Jennings for decades to follow: Holly jokingly told Jennings, "Well, I hope your ol' bus freezes up!" Jennings jokingly replied, "Well, I hope your ol' plane crashes!" Less than an hour and a half later, shortly after 1:00 am on February 3, 1959 (later known as The Day the Music Died), Holly's charter plane crashed at full throttle into a cornfield outside Mason City, instantly killing all on board. Later that morning, Jennings's family heard on the radio that "Buddy Holly and his band had been killed." After calling his family, Jennings called Sky Corbin at KLLL from Fargo to say that he himself was alive. The General Artists Corporation promised to pay for first-class tickets for Jennings and the band to attend Holly's funeral in Lubbock in exchange for them playing that night in Moorhead. After the first show, they were initially denied their payment by the venue, but after Jennings's persistence, they were paid. The flights were never paid, and Jennings and Allsup continued the tour for two more weeks, featuring Jennings as the lead singer. They were paid less than half of the original agreed salary, and upon returning to New York, Jennings put Holly's guitar and amplifier in a locker in Grand Central Terminal and mailed the keys to Maria Elena Holly. Then, he returned to Lubbock. For decades afterward, Jennings repeatedly admitted that he felt responsible for the crash that killed Holly. This sense of guilt precipitated bouts of substance abuse through much of Jennings's career. The day of the flight was later known as the Day the Music Died. Jennings sang "The Stage", a tribute to the Day the Music Died. "Jole Blon" was released on Brunswick in March 1959 with limited success. Now unemployed, Jennings returned to KLLL. Deeply affected by the death of Holly, Jennings's performance at the station worsened. He left the station after he was denied a raise, and later worked briefly for the competition, KDAV. Due to Maxine's father's illness, Jennings had to shuttle between Arizona and Texas. While his family lived back in Littlefield, Jennings found a job briefly at KOYL in Odessa, Texas. He moved with his family to Coolidge, Arizona, where his wife's sister lived. He found a job performing at the Galloping Goose bar, where he was heard by Earl Perrin, who offered him a spot on KCKY. Jennings also played during the intermission at drive-in theaters and in bars. After a successful performance at the Cross Keys Club in Phoenix, he was approached by contractors who were building a club for Jimmy D. Musiel, called JD's. Musiel employed Jennings as his main artist and designed the club around his act. He formed his backing band, The Waylors, with bassist Paul Foster, guitarist Jerry Gropp, and drummer Richie Albright. Jennings and his band performed at the newly opened nightspot in Scottsdale, where they soon earned a strong local fanbase. At JD's, Jennings developed his "rock tempered" style of country music that defined him on his later career. In 1961, Jennings signed a recording contract with Trend Records, and experienced moderate success with his single, "Another Blue Day". His friend, Don Bowman, took demos of Jennings to Jerry Moss, who at the time was starting A&M Records with associate Herb Alpert. On July 9, 1963, Jennings signed a contract with A&M that granted him 5% of record sales. At A&M, he recorded "Love Denied" backed with "Rave On", and "Four Strong Winds" backed with "Just to Satisfy You". He followed up by recording demos of "The Twelfth of Never", "Kisses Sweeter than Wine", and "Don't Think Twice, It's All Right", and also produced the single "Sing the Girls a Song, Bill", backed with "The Race Is On". The singles were released between April and October 1964. His records had little success, because A&M's main releases were folk music rather than Country. He had a few hits on local radio in Phoenix, with Ian Tyson's "Four Strong Winds" and "Just To Satisfy You", which was co-written with Bowman. Meanwhile, he recorded an album on BAT records, called Waylon at JD's. After 500 copies were sold at the club, another 500 copies were pressed by the Sounds label. He also played lead guitar for Patsy Montana on a 1964 album. Singer Bobby Bare heard Jennings's "Just to Satisfy You" on his car radio while passing through Phoenix, eventually recording it and "Four Strong Winds". After stopping in Phoenix to attend a Jennings performance at JD's, while driving to Las Vegas, Bare stopped and called Chet Atkins in Nashville, suggesting that he needed to sign Jennings. When he was made aware of the new deal, Waylon was not sure if he should quit his gig at JD's. He then went to get the advice of his friend, RCA artist Willie Nelson, who had gone to see one of Waylon's shows. 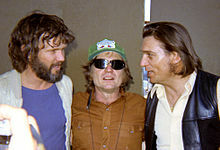 When Willie and Waylon met, after talking about the possibilities and considering Waylon's profits at the club, Nelson suggested that Waylon should stay in Phoenix and not to move to Nashville. Nonetheless, Jennings decided to accept the offer, and asked Herb Alpert to release him from his contract with A&M. Alpert agreed, though later A&M would compile all of Jennings's singles and unreleased material the label had and release it as Don't Think Twice. Atkins formally signed Jennings to RCA Victor in 1965. On August 21, Jennings made his first appearance on the Billboard's Hot Country Songs chart with "That's the Chance I'll Have to Take". From the album of the same name, the song was a local radio hit for Jennings in Nashville. In 1966, Jennings released his debut album for RCA Folk-Country, followed by Leavin' Town and Nashville Rebel. Leavin' Town resulted in significant chart success as the first two singles "Anita, You're Dreaming" and "Time to Burn Again" both peaked at no. 17 on the Billboard Hot Country Songs chart. The album's third single, a cover of Gordon Lightfoot's "(That's What You Get) For Lovin' Me", became Jennings's first top 10 single, peaking at no. 9. Nashville Rebel was the soundtrack to an independent film of the same name, starring Jennings. The single "Green River" charted on Billboard country singles at #11. In 1967, Jennings released a hit single, "Just to Satisfy You". During an interview, Jennings remarked that the song was a "pretty good example" of the influence of his work with Buddy Holly and rockabilly music. Jennings produced midchart albums that sold well, including Just to Satisfy You, that included the same-named hit single of 1967. Jennings's singles enjoyed success. "The Chokin' Kind" peaked at number eight on Billboard's Hot Country Singles in 1967, while "Only Daddy That'll Walk the Line" hit number two the following year. In 1969, his collaboration with The Kimberlys on the single "MacArthur Park" earned a Grammy Award for Best Country Performance by a Duo or Group. His single "Brown Eyed Handsome Man" reached number three at the Hot Country Singles chart by the end of the year. During this time, Jennings rented an apartment in Nashville with singer Johnny Cash. Jennings and Cash were both managed by "Lucky" Moeller's booking agency Moeller Talent, Inc. The tours organized by the agency were unproductive, with the artists being booked to venues located far from each other in close dates. After paying for the accommodation and travel expenditures, Jennings's profits were reduced, with him frequently requesting advances from the agency or RCA Records to play the next venue. While playing 300 days on the road, Jennings's debt increased along with his consumption of amphetamines, as he believed himself to be trapped on the circuit. In 1972, Jennings released Ladies Love Outlaws. The single that headlined the album became a hit for Jennings, and was his first approach to Outlaw Country. Jennings was accustomed to performing and recording with his own band, The Waylors, a practice that was not encouraged by powerful Nashville producers. Over time, however, Jennings felt limited by the Nashville sound's lack of artistic freedom. The music style publicized as "Countrypolitan" was characterized by orchestral arrangements, and the absence of traditional Country music instruments. The producers did not let Jennings play his own guitar or select material to record. In an interview, Jennings recalled the restrictions of the Nashville establishment: "They wouldn't let you do anything. You had to dress a certain way: you had to do everything a certain way.... They kept trying to destroy me.... I just went about my business and did things my way.... You start messing with my music, I get mean." By 1972, after the release of Ladies Love Outlaws, his recording contract was nearing an end. Sick with hepatitis, Jennings was hospitalized. Afflicted by disease, and the music industry, he was considering retirement. Albright visited him and convinced him to continue. Albright talked to him about making Neil Reshen his new manager. Meanwhile, Jennings requested a US$25,000 royalty advance from RCA Records to cover his living expenses during his recovery. The same day he met Rashen, RCA sent Jerry Bradley to offer Jennings US$5,000 as a bonus for signing a new 5% royalty deal with RCA, the same terms he had accepted in 1965. After reviewing with Reshen, he rejected the offer and hired Reshen. Reshen started to renegotiate Jennings's recording and touring contracts. At a meeting in a Nashville airport, Jennings introduced Reshen to Willie Nelson. By the end of the meeting, Reshen had become Nelson's manager, as well. Jennings's new deal gained him a $75,000 advance and artistic control. Reshen advised Jennings to keep the beard that he had grown in the hospital, to match the image of Outlaw Country. By 1973, Nelson had returned to music, finding success with Atlantic Records. Now based in Austin, Texas, he had made inroads into the rock and roll press by attracting rock audiences. Atlantic Records was now attempting to sign Jennings, but Nelson's rise to popularity persuaded RCA to renegotiate with Jennings before losing another potential star. In 1973, Jennings released Lonesome, On'ry and Mean and Honky Tonk Heroes, the first albums recorded and released under his creative control. The release of these albums heralded a major turning point for Jennings, kicking off his most critically and commercially successful years. More hit albums followed with This Time and The Ramblin' Man, both released in 1974. The title tracks of both albums topped the Billboard Country singles chart, with the self-penned "This Time" becoming Jennings's first no. 1 single. Dreaming My Dreams, released in 1975, included the no. 1 single "Are You Sure Hank Done It This Way" and was his first album to be certified gold by the RIAA; it was also the first of his next six consecutive, solo studio albums to be certified gold or higher. In 1976, Jennings released Are You Ready for the Country, Jennings wanted the record to be produced by Los Angeles producer Ken Mansfield. Although RCA denied the request, Jennings and The Waylors went to Los Angeles and recorded with Mansfield at his expense. After a month, Jennings presented the master tape to Chet Atkins, who decided to release it. The album hit number one on Billboard's country albums three times the same year, topping the charts for 10 weeks. It was named Country album of the year in 1976 by Record World magazine and it was certified gold by the RIAA. In 1976, Jennings released the album Wanted! The Outlaws, recorded with Willie Nelson, Tompall Glaser, and Jessi Colter for RCA. The album was the first Country music album certified platinum. The following year, RCA issued Ol' Waylon, an album that produced a hit duet with Nelson, "Luckenbach, Texas". The album Waylon and Willie followed in 1978, producing the hit single "Mammas Don't Let Your Babies Grow Up to Be Cowboys". Jennings released I've Always Been Crazy, also in 1978. The same year, at the peak of his success, Jennings began to feel limited by the outlaw movement. Jennings referred to the overexploitation of the image in the song "Don't You Think This Outlaw Bit's Done Got Out of Hand? ", claiming that the movement had become a "self-fulfilling prophecy". In 1979, he released Greatest Hits, which was certified gold the same year, and quintuple platinum in 2002. Also in 1979, Jennings joined the cast of the CBS series The Dukes of Hazzard as the Balladeer, the narrator. The only episode to feature him in person was "Welcome, Waylon Jennings", during the seventh season. Jennings played himself, presented as an old friend of the Duke family. For the show, he also wrote and sang the theme song "Good Ol' Boys", which became the biggest hit of his career. Released as a single in promotion with the show, it became Jennings's 12th single to reach number one on the Billboard Country Singles chart. It was also a crossover hit, peaking at no. 21 on the Billboard Hot 100. In the mid-1980s, Johnny Cash, Kris Kristofferson, Nelson, and Jennings formed a successful group called The Highwaymen. Aside from his work with The Highwaymen, Jennings released a gold album WWII (1982) with Willie Nelson. In 1985, Jennings joined with USA for Africa to record "We Are the World", but he left the studio because of a dispute over the song's lyrics that were to be sung in Swahili. Ironically, after Jennings left the session, the idea was dropped at the prompting of Stevie Wonder, who pointed out that Ethiopians did not speak Swahili. By this time, his sales had decreased. After the release of Sweet Mother Texas, Jennings signed with Music Corporation of America. The debut release with the label Will the Wolf Survive (1985) peaked at number one in Billboard's Country albums in 1986. Jennings's initial success tailed off, and in 1990, he signed with Epic Records. His first release, The Eagle, became his final top 10 album. Also in 1985, he made a cameo appearance in the live-action children's film Sesame Street Presents: Follow That Bird. In the movie, he plays a turkey farm truck driver who gives Big Bird a lift. He also sings one of the film's songs, entitled "Ain't No Road Too Long". In 1993, in collaboration with Rincom Children's Entertainment, Jennings recorded an album of children's songs, Cowboys, Sisters, Rascals & Dirt, which included "Shooter's Theme", a tribute to his 14-year-old with the theme of "a friend of mine". Although his record sales and radio play dwindled during the '90s, Jennings continued to draw large crowds at his live performances. In 1996, Jennings released his album, Right for the Time, including some of his newer songs, including "The Most Sensible Thing", which was covered by Angry Grandpa in 2015. In 1997, after the Lollapalooza tour, he decreased his tour schedule and became centered on his family. In 1998, Jennings teamed up with Bare, Jerry Reed, and Mel Tillis to form the Old Dogs. The group recorded a double album of songs by Shel Silverstein. In mid-1999, Jennings assembled what he referred to as his "hand-picked dream team" and formed Waylon & The Waymore Blues Band. Consisting primarily of former Waylors, the 13-member group performed concerts from 1999 to 2001. In January 2000, Jennings recorded what became his final album at Nashville's historic Ryman Auditorium, Never Say Die: Live. Jennings's music was characterized by his "powerful" singing voice, noted by his "rough-edged quality", as well as his phrasing and texture. He was also recognized for his "spanky-twang" guitar style. To create his sound, he used a pronounced 'phaser' effect (see 'Modulation Effects': below) plus a mixture of thumb and fingers during the rhythmic parts, while using picks for the lead runs. He combined hammer-on and pull-off riffs, with eventual upper-fret double stops and modulation effects. Jennings played a 1953 Fender Telecaster, a used guitar that was a gift from The Waylors. Jennings's bandmates adorned his guitar with a distinctive leather cover that featured a black background with a white floral work. Jennings further customized it by filing down the frets to lower the strings on the neck to obtain the slapping sound. Among his other guitars, Jennings used a 1950 Fender Broadcaster from the mid-1970s, until he gave it to guitarist Reggie Young in 1993. The leather covers of his guitars were carved by leather artist Terry Lankford. His signature image was characterized by his long hair and beard, as well as his black hat and the black leather vest he wore during his appearances. Jennings was married four times, and had six children. He was first married to Maxine Caroll Lawrence in 1956 at age 18, with whom he had four children: Terry Vance Jennings (January 21, 1957 – January 25, 2019), Julie Rae Jennings (August 12, 1958 – October 3, 2014), Buddy Dean Jennings (born March 21, 1960), and Deana Jennings. Jennings married again on December 10, 1962, to Lynne Jones, adopting a child, Tomi Lynne. They divorced in 1967. He next married Barbara Elizabeth Rood in 1967. He composed the song "This Time" about the trials and tribulations of his marriages and divorces. He married for the fourth and final time in Phoenix, Arizona, on October 26, 1969, to Jessi Colter. Colter and Jennings had one son, Waylon Albright Jennings (aka Shooter Jennings, born May 19, 1979). Colter had one daughter, Jennifer, from her previous marriage to Duane Eddy. In the early 1980s, Colter and Jennings nearly divorced due to his addiction to drugs and other forms of substance abuse. However, they remained together until Jennings's death in 2002. In 1997, he gave up touring to be closer to his family. To set an example about the importance of education to his son Waylon Albright, Jennings earned a GED at age 52. Jennings started to consume amphetamines while he lived with Johnny Cash during the mid-1960s. Jennings later stated, "Pills were the artificial energy on which Nashville ran around the clock." In 1977, Jennings was arrested by federal agents for conspiracy and possession of cocaine with intent to distribute. A private courier warned the Drug Enforcement Administration about the package sent to Jennings by a New York colleague that contained 27 grams of cocaine. The DEA and the police searched Jennings's recording studio. They found no evidence, because while they were waiting for a search warrant, Jennings disposed of the cocaine. The charges were later dropped and Jennings was released. The episode was recounted in Jennings's song "Don't You Think This Outlaw Bit's Done Got Outta Hand?" During the early 1980s, his cocaine addiction intensified. Jennings claimed to have spent $1,500 a day on his habit, draining his personal finances and leaving him bankrupt with debt up to $2.5 million. Though he insisted on repaying the debt and did additional tours to earn the funds, his work became less focused and his tours deteriorated. Jennings decided to quit his addictions, leased a home in the Phoenix area, and spent a month detoxing himself, intending to start using cocaine again in a more controlled fashion afterward. In 1984, he quit cocaine. June Carter Cash held his recovery anniversary party at her Old Hickory Lake residence near Nashville. Jennings claimed that his son Shooter was his main inspiration to quit permanently. Jennings's health had been deteriorating for years before his death. After quitting cocaine, he ended his habit of smoking six packs of cigarettes daily in 1988. The same year, he underwent heart bypass surgery. By 2000, his diabetes worsened, and the pain reduced his mobility, forcing Jennings to end most touring. Later the same year, he underwent surgery to improve his leg circulation. In December 2001, his left foot was amputated at a hospital in Phoenix. On February 13, 2002, Jennings died in his sleep of diabetic complications at the age of 64, in Chandler, Arizona. He was buried in the City of Mesa Cemetery, in Mesa, Arizona. At the funeral ceremony, on February 15, Jessi Colter sang "Storms Never Last" for the attendees, who included Jennings's close friends and fellow musicians. Between 1966 and 1995, 54 Jennings albums charted, with 11 reaching number one. Meanwhile, between 1965 and 1991, 96 singles charted, with 16 number ones. In October 2001, Jennings was inducted into the Country Music Hall of Fame. In one final act of defiance, he did not attend the ceremony and opted instead to send son Buddy Dean Jennings. On July 6, 2006, Jennings was inducted to Guitar Center's RockWalk in Hollywood, California. On June 20, 2007, Jennings was posthumously awarded the Cliffie Stone Pioneer Award by the Academy of Country Music. Jennings's music had a major influence on several neotraditionalist and alternative country artists, including Hank Williams Jr., The Marshall Tucker Band, Travis Tritt, Steve Earle, Jamey Johnson, John Anderson, his son, Shooter Jennings, Sturgill Simpson, and Hank Williams III. In 2008, his first posthumous album, Waylon Forever, was released. The album consisted of songs recorded with his son Shooter when he was 16. In 2012, Waylon: The Music Inside a three-volume project, consisting of covers of Jennings's songs by different artists, was released. The same year, it was announced for September the release of Goin' Down Rockin': The Last Recordings, a set of 12 songs recorded by Jennings and bassist Robby Turner before his death in 2002. Jennings's family was reluctant to release any new material because they did not feel comfortable at the time. The songs only featured Jennings and Turner on the bass, while further accompaniment would be added later. Ten years after, Turner completed the recordings with the help of former Waylors. The Jennings family approved the release despite the launch of a new business focused on his estate. Shooter Jennings arranged deals for a clothing line, while also launching a renewed website, and started talks with different producers about the making of a biographical film. ^ Jennings, Waylon; Kaye, Lenny 1996, p. 9, 11. ^ Jennings, Waylon; Kaye, Lenny 1996, p. 6. ^ Jasinski, Laurie 2012, p. 432. ^ Jennings, Waylon; Kaye, Lenny 1996, p. 22. ^ a b c d Dansby, Andrew (February 14, 2002). "Waylon Jennings Dead at Sixty-four". Rolling Stone. Wenner Media LLC. Retrieved November 1, 2011. ^ Wishart 2004, p. 540. ^ Jennings, Waylon; Kaye, Lenny 1996, p. 271. ^ Jennings, Waylon; Kaye, Lenny 1996, p. 34. ^ Jennings, Waylon; Kaye, Lenny 1996, p. 36. ^ a b Carr & Munde 1997, p. 154. ^ Jennings, Waylon; Kaye, Lenny 1996, p. 31-33. ^ Jennings, Waylon; Kaye, Lenny 1996, p. 39. ^ Jennings, Waylon; Kaye, Lenny 1996, p. 48. ^ Amburn, Ellis 2014, p. 15. ^ a b c d Carr & Munde 1997, p. 155. ^ Jennings, Waylon; Kaye, Lenny 1996, p. 40. ^ Jennings, Waylon; Kaye, Lenny 1996, p. 47. ^ Corbin, Sky. "The Waylon Jennings Years at KLLL (Part One)". KLLL. KLLL Lubbock. Archived from the original on July 14, 2014. Retrieved July 2, 2014. ^ a b Jennings, Waylon; Kaye, Lenny 1996, p. 51. ^ Corbin, Sky. "The Waylon Jennings Years at KLLL (Part Two)". KLLL. KLLL Lubbock. Archived from the original on July 14, 2014. Retrieved July 2, 2014. ^ Corbin, Sky. "The Waylon Jennings Years at KLLL (Part Four)". KLLL. KLLL Lubbock. Archived from the original on July 14, 2014. Retrieved July 2, 2014. ^ Corbin, Sky. "The Waylon Jennings Years at KLLL (Part Five)". KLLL. KLLL Lubbock. Archived from the original on July 14, 2014. Retrieved July 2, 2014. ^ Jennings, Waylon; Kaye, Lenny 1996, p. 58, 59. ^ Jennings, Waylon; Kaye, Lenny 1996, p. 62. ^ Hetter, Katia; Marsh, Rene (March 4, 2015). "Buddy Holly plane crash may be re-examined". cnn.com. ^ Everitt, Rich 2004, p. 15. ^ Everitt, Rich 2004, p. 18, 19. ^ Corbin, Sky. "The Waylon Jennings Years at KLLL (Part Six)". KLLL. KLLL Lubbock. Archived from the original on July 14, 2014. Retrieved July 2, 2014. ^ Jennings, Waylon; Kaye, Lenny 1996, p. 71. ^ Jennings, Waylon; Kaye, Lenny 1996, p. 72. ^ Jennings, Waylon; Kaye, Lenny 1996, p. 73. ^ Jennings, Waylon; Kaye, Lenny 1996, p. 74. ^ Jennings, Waylon; Kaye, Lenny 1996, p. 70. ^ Jennings, Waylon; Kaye, Lenny 1996, p. 77-81. ^ Jennings, Waylon; Kaye, Lenny 1996, p. 81. ^ Jennings, Waylon; Kaye, Lenny 1996, p. 82-86. ^ Jennings, Waylon; Kaye, Lenny 1996, p. 89. ^ Smith, John 1995, p. 15. ^ a b Erlewine, Stephen Thomas; Bogdanov, Vladimir; Woodstra Chris 2003, p. 375. ^ Carr & Munde 1997, p. 159. ^ a b c Carr & Munde 1997, p. 156. ^ Jennings, Waylon; Kaye, Lenny 1996, p. 94-96. ^ Wolff & Duane 2000, p. Waylon Jennings at Google Books. ^ Streissguth, Michael 2013, p. 52. ^ Jennings, Waylon; Kaye, Lenny 1996, p. 102-103. ^ Jennings, Waylon; Kaye, Lenny 1996, p. 104. ^ Smith, John 1995, p. 231. ^ Wolff & Duane 2000, p. 360. ^ a b Henderson, Richard 2001, p. 84. ^ a b Cramer, Alfred 2009, p. 715. ^ Thompson 2002, p. 622. ^ Country song roundup staff 1967. ^ Kingsbury 2004, p. 247. ^ Streissguth, Michael 2007, p. 135. ^ Kingsbury 2004, p. 333. ^ Jennings, Waylon; Kaye, Lenny 1996, p. 112, 182. ^ Larkin 1995, p. 3005. ^ Petrusich 2008, p. 105. ^ Ashby, LeRoy 2006, p. p.418. ^ Jennings, Waylon; Kaye, Lenny 1996, p. 182-186. ^ Jennings, Waylon; Kaye, Lenny 1996, pp. 187–192. ^ Petrusich 2008, p. 106. ^ Larkin 1995, p. 2159. ^ Lewis 1993, p. 169. ^ Jennings, Waylon; Kaye, Lenny 1996, p. 266. ^ Reid, Jan 2004, p. p. 224. ^ Wolff & Duane 2000, p. 340. ^ Erlewine, Stephen Thomas. "The Ramblin' Man – Overview". Allmusic. Rovi Corporation. Retrieved October 24, 2011. ^ Huang, Hao 1999, p. 325. ^ a b Wishart 2004, p. 54. ^ a b Lewis 1993, p. 169. ^ Schäfer 2012, p. 60. ^ "RIAA Searchable Database". RIAA.com. The Recording Industry Association of America. Archived from the original on September 28, 2013. Retrieved May 22, 2012. ^ Breskin 2004, p. 6. ^ Cagle, Jess (January 24, 1992). "They Were the World". Entertainment Weekly. Retrieved July 11, 2009. ^ a b c d Erlewine, Stephen Thomas. "Waylon Jennings – Biography". Allmusic. Rovi Corporation. ^ "Will the Wolf Survie?". Allmusic. Rovi Corporation. Retrieved October 25, 2011. ^ Clarke 1998, p. 648. ^ Jennings, Waylon; Kaye, Lenny 1996, p. 370. ^ Birk, Carl 2005, p. p.71. ^ Ankeny, Jason. "Old Dogs". Allmusic. Rovi Corporation. Retrieved October 25, 2011. ^ George-Warren, Romanowski & Pareles 2001, p. 492. ^ D'Angelo, Joe (February 13, 2002). "Country Music Outlaw Waylon Jennings Dies at 64". MTV News. MTV Networks. Retrieved October 25, 2011. ^ Brown 1986, p. 132. ^ Ward 2012, p. 308. ^ Hunter 2010, p. 124. ^ Hunter 2010, p. 125. ^ Jennings, Waylon; Kaye, Lenny 1996, p. 105. ^ "Waylon Jennings guitar". Country Guitar. Country Guitar Magazine. February 1995. p. 15. ^ "Interview: Waylon Jennings". Guitar Player. Vol. 7. Miller Freeman Publications. 1973. p. 118. ^ "Waylon Jennings Fender Electric Instrument Company, a solid-body electric guitar, broadcaster, Fullerton, CA, circa 1950". Christie's. Christies.com. Retrieved June 14, 2013. ^ Arender, Tammi; Terry Lankford (April 19, 2012). "2542". "Lankford Leather". Tennessee Crossroads (Interview). Nashville, Tennessee: WNPT. Archived from the original on November 1, 2013. ^ "Country great Waylon Jennings dies at 64". CNN. Turner Broadcasting System, Inc. February 14, 2002. Archived from the original on December 16, 2011. Retrieved May 22, 2012. ^ de Rubio, Dave Gil (April 13, 2012). "Willie Nelson: Live! At the US Festival 1983". American Songwriter. American Songwriter, LLC. Retrieved May 22, 2012. ^ a b c d Birk, Carl 2005, p. p.72. ^ Hart 2007, p. 184. ^ a b Jennings, Waylon; Kaye, Lenny 1996, pp. 322–325. ^ a b Weatherby, Gregg 1988, p. p.46. ^ Ching, Barbara 2001, p. 124. ^ Colter, Jessi ; Ritz, David. (2017). An outlaw and a lady : a memoir of music, life with Waylon, and the faith that brought me home. Nashville, TN: Nelson Books. p. 219. ISBN 9780718082970. ^ "The Outlaw in Love". People.com. Retrieved July 3, 2013. ^ Jennings, Waylon; Kaye, Lenny 1996, p. 322. ^ "Jennings alert after heart bypass surgery". ^ "Guitar Center's Hollywood RockWalk". Rockwalk.com. Guitar Center, Inc. Archived from the original on July 15, 2011. Retrieved October 25, 2011. ^ Guralnick, Peter 1989, p. 203. ^ Browne, Ray; Browne, Pat 2001, p. p.515. ^ Jennings, Waylon; Kaye, Lenny 1996, p. 333. ^ Fox, Pamela; Ching, Barbara 2008, p. 10. ^ Talbott, Chris (February 13, 2012). "New Music on the Way From Late Waylon Jennings". Huffington Post. AOL, Inc. Archived from the original on April 20, 2014. Retrieved April 18, 2014. ^ "21st Annual GRAMMY Awards". GRAMMY.com. November 28, 2017. Retrieved February 6, 2019. ^ a b Jasinski, Laurie E., ed. (February 22, 2012). Handbook of Texas Music. Texas A&M University Press. p. 831. ISBN 9780876112977. ^ Browne, David; et al. (June 15, 2017). "100 Greatest Country Artists of All Time". Rolling Stone. Retrieved February 6, 2019. Amburn, Ellis (2014). Buddy Holly: Biography. St. Martin's Griffin. ISBN 978-1-466-86856-4. Ashby, LeRoy (2006). With Amusement for All: a History of American Popular Culture Since 1830. University Press of Kentucky. ISBN 978-0-8131-2397-4. Birk, Carl (2005). Unfurrowed Ground: The Innovators of Country Music. Infinity Publishing. ISBN 978-0-74142457-0. Breskin, David (2004). We Are the World: The Story Behind the Song booklet (Media notes). Image Entertainment, Inc.
Brown, Charles (1986). Music U.S.A.: America's Country & Western Tradition. Prentice-Hall. Browne, Ray; Browne, Pat (2001). The Guide to United States Popular Culture. Popular Press. ISBN 978-0-06097174-8. Ching, Barbara (2001). Wrong's What I Do Best: Hard Country Music and Contemporary Culture. Oxford University Press. ISBN 978-0-19510835-4. Corbin, Sky (2004). Waylon in Lubbock. Country Music Classics. Archived from the original on November 1, 2013. Retrieved August 8, 2012. Cramer, Alfred (2009). Musicians and Composers of the 20th Century-Volume 2. Salem Press. ISBN 978-1-58765-514-2. Clarke, Donald (1998). The Penguin Encyclopedia of Popular Music. Penguin Books. ISBN 978-0-14-051370-7. Cunniff, Albert (1985). Waylon Jennings. Zebra Books. ISBN 0821717227. Everitt, Rich (2004). Falling Stars: Air Crashes That Filled Rock and Roll Heaven. Harbor House. ISBN 978-1-89179904-4. Erlewine, Stephen Thomas; Bogdanov, Vladimir; Woodstra Chris (2003). All Music Guide to Country: The Definitive Guide to Country Music. ISBN 9780879307608. Fox, Pamela; Ching, Barbara (2008). Old Roots, New Routes: The Cultural Politics of Alt.Country Music. University of Michigan Press. ISBN 978-0-47205053-6. George-Warren, Holly; Romanowski, Patricia; Pareles, Jon (2001). The Rolling Stone Encyclopedia of Rock & Roll. Fireside. ISBN 978-0-7432-0120-9. Guralnick, Peter (1989). Lost Highway: Journeys & Arrivals of American Musicians. HarperPerennial. ISBN 978-0-06097174-8. Hart, Kylo-Patrick (2007). Mediated Deviance and Social Otherness: Interrogating Influential Representations. Cambridge Scholars Publishing. ISBN 978-1-84718-245-6. Huang, Hao (1999). Music in the 20th Century. 2. M.E. Sharp. ISBN 978-0-7656-8012-9. Hunter, David (2010). Star Guitars: 101 Guitars That Rocked the World. Voyageur Press. ISBN 978-076033821-6. Jasinski, Laurie (2012). Handbook of Texas Music. Texas A&M University Press. ISBN 978-0-876-11297-7. Larkin, Colin (1995). Guinness Encyclopedia of Popular Music. 3 (2nd ed.). Guinness Publishing. ISBN 978-1-56159-176-3. Lewis, George (1993). All That Glitters: Country Music in America. Popular Press. ISBN 978-0-87972-574-7. Petrusich, Amanda (2008). It Still Moves: Lost Songs, Lost Highways, and the Search for the Next American Music. Macmillan. ISBN 978-0-86547-950-0. Seal, Graham (2011). Outlaw Heroes in Myth and History. Anthem Press. ISBN 978-0-85728-792-2. Schäfer, Stephanie (2012). "Cashville" - Dilution of Original Country Music Identity Through Increasing Commercialization. Diplomica Verlag. ISBN 9783842878457. Smith, John (1995). The Waylon Jennings Discography. 9780313297458. Streissguth, Michael (2007). Johnny Cash: The Biography. Da Capo Press. ISBN 978-0-306-81565-2. Streissguth, Michael (2013). Outlaw: Waylon, Willie, Kris, and the Renegades of Nashville. Harper Collins. ISBN 978-0-0620-3820-3. Thompson, Clifford (2002). Current Biography Yearbook 2002. H.W. Wilson. p. 622. ISBN 978-0-8242-1026-7. Ward, Robert (2012). Renegades: My Wild Trip from Professor to New Journalist With Outrageous Visits from Clint Eastwood, Reggie Jackson, Larry Flynt, and Other American Icons. Adams Media. ISBN 978-144053314-3. Wishart, David (2004). Encyclopedia of the Great Plains. University of Nebraska Press. ISBN 978-0-8032-4787-1. Denberg, Jody (January 1988). "Chantilly Lace and Jolly Face". Texas Monthly. Vol. 16 no. 1. ISSN 0148-7736. Henderson, Richard (May 12, 2001). "The RCA 100: Ambitious Reissue Program Represents A Century of Diverse Music". Billboard. Vol. 113 no. 19. ISSN 0006-2510. Jessen, Wade; Evans Price, Deborah; Stark, Phyllis (February 23, 2002). "Waylon Jennings Remembered as Country Music Legend". Billboard. Vol. 114 no. 8. ISSN 0006-2510. Weatherby, Gregg (1988). "Still Waylon". Spin. Vol. 3 no. 8. SPIN Media LLC. ISSN 0886-3032. "Patsy Montana Early Country Favorites". Bluegrass Unlimited. Vol. 18 no. 1–6. Bluegrass Unlimited. 1983. ISSN 0006-5137. Country song roundup staff (1967). "Country song roundup". No. 102. Country Song Roundup. p. 15. Denisoff, R. Serge. Waylon: A Biography (1983). Knoxville: University of Tennessee Press. ISBN 0-87049-387-6. Smith, John L. (compiled by) The Waylon Jennings Discography (1995). Greenwood Press. ISBN 0-313-29745-2. This page was last edited on 6 April 2019, at 07:04 (UTC).